The more you like the music of James Taylor and Carole King, the more you will like Troubadours. And you’re almost guaranteed not to like it as well as my audience in Boulder, on the opening night of our film festival, with a packed crowd of boomers who grew up listening to that music. We laughed at the in-jokes; we applauded the filmed performances as if they were live; and thankfully, we did not start singing along. Troubadours is a name-dropping documentary, with significant sections on Taylor, King, and Elton John, along with talking-head interviews from Steve Martin, David Crosby, producers, bartenders, and a noted L.A. music critic who you will recognize if you’re into that sort of thing. They’re all talking about a bar called the Troubadour that had the right vibe in the right place at the right time — the late ’60s and early ’70s. 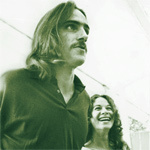 James Taylor is not just a pretty voice; he also represents a movement in music, or so the documentary says. It’s a post-60’s rock and roll era when people needed to slow down from all the drugs and the war. They were tired of the mobs of screaming fans at the shows of big-name bands. They started to come to small clubs and coffee houses to connect one-on-one with singer/songwriters who spoke from the heart. Or so the story goes. Troubadours does a good job of framing the music in its historical context. It gives you a sense of why the Troubadour had such success, and why it eventually failed. And of course it gives you a lot of period music. I did like the music, and I recognized much of it, but I don’t feel like the music is mine. It belongs to the people a half-generation older than I am. And although there are documentaries where you’d say “...even if you don’t like this music, you’ll like the movie...”, I don’t think this is one of them. I did like the movie. Just not as much as its intended audience.